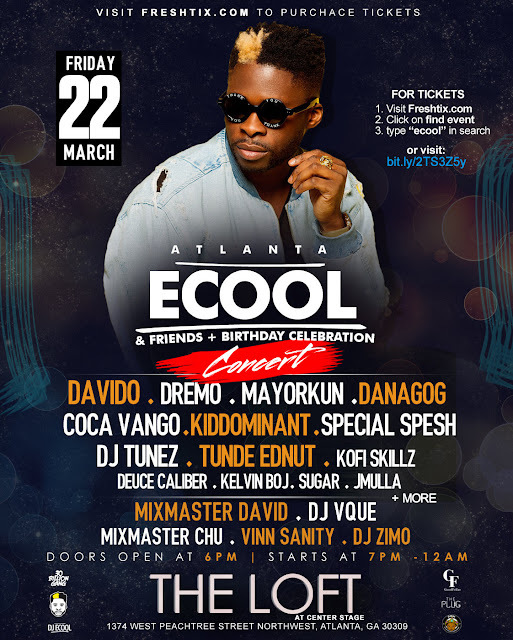 Atlanta is not a stranger to the event "DJ ECool & Friends" Usually held at local clubs & directed by world famous international DJ, ECool but this time its a convert done a proper venue With special guest performers like DAVIDO, DREMO, MAYORKUN, DANAGOG, COCA VANGO, KIDDOMINANT, SPECIAL SPESH, DJ TUNEZ, EFYA, & MORE. Music of the night will be curated by Atlanta's house hold names; MIX MASTER DAVID, MIXMASTER CHU, DJ VQUE, DJ VINN, DJ ZIMO. This will be a fun filled night with Dancing, Singing, and lots more.